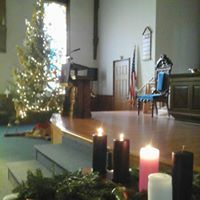 During Advent, Christmas and Epiphany our sanctuary has its Advent candles displayed in front of the altar platform, on a table festooned with greens on a white cloth. 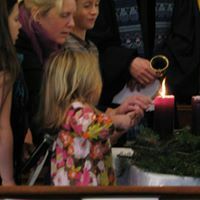 Each week a child is called to light the new candle as we all pray together. 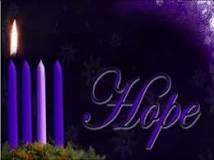 Many years ago our minister John Knight made the wood stand for the 4 large candles: 3 (penitential) purple and 1 (joy) pink. On each Sunday a new candle is lit. A separate white candle stands alone as the Christ Candle for Christmas Eve. When we come together this 1st Sunday of Advent and sing “O Come, O Come, Emmanuel” we will be participating in a sacred Advent ritual more than a thousand years old. It takes us back to monastic life in the 8th- or 9th-century. For the week leading up to Christmas, they would sing a sequence of Latin “O antiphons” (an antiphon is a short chant like a refrain based on scripture). The purpose of these O antiphons was to concentrate the mind on the coming Christmas with a sequence of scriptures. Each day was a different O antiphon, climaxing with this one. Click here for a lovely rendition of the Latin original. Advent has another week to go, the week of deepest darkness that comes before the glorious Christmas dawn. The more we immerse in the spirit of Advent–making time for our spiritual life doing things like reading, praying, getting out in nature, serving people in need–the more joyous our Christmas can be. Yet joyous outbursts are part of Advent, too–we felt it last week on Pageant Sunday and we will feel it Christmas Eve in the first half of the 6:00 PM service. We will begin this Sunday in joy, too, celebrating Christ’s birth by hearing some of the nativity story and singing “God Rest Ye Merry, Gentlemen” and “Lo, How a Rose E’er Blooming,” and “It Came Upon a Midnight Clear.” The choir will sing “Do You Hear What I Hear?” and a trio of Betsy Alexander, Bridget Peters and Marcia Tomlinson will sing “Jesus Christ the Apple Tree.” John Atwood will be playing special music involving chimes and a major Bach Prelude and Fugue that is traditionally associated with Christmas. The sermon will reflect on the “Universal, Unconditional, Unstoppable Love” that we witness in the Christmas story, and that we continue to see at work in our lives and in the world today. Yet like Christmas Eve, we will end the service quieting into the silent night of Advent still left ahead, singing “O Come, O Come Emmanuel” and the ancient plainsong benediction one last time. John’s postlude will be the Ukrainian Bell Carol. This Sunday will be a glorious mix of high and low church art, all of it beautiful and moving. The children’s pageant will once again act out the story as our Diverse Musical Traditions Team sings the Gaither song, “Come and See What’s Happenin’ in the Barn!” We are hoping to have fourteen children participate, which is very exciting! The same team will also sing the classic bluegrass Christmas song, “Beautiful Star of Bethlehem” which has been recorded by everyone from Ralph Stanley to Emmylou Harris and over four hundred others. 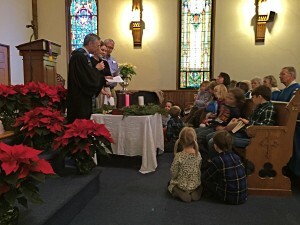 Our congregational hymns will include “O Little Town of Bethlehem,” “Joy to the World” (the children will sing it with the choir at the end of the Pageant and the congregation will join in at the end) and “Come Thou Long Expected Jesus,” as well as the Benediction hymn set to the ancient plainchant Advent tune. 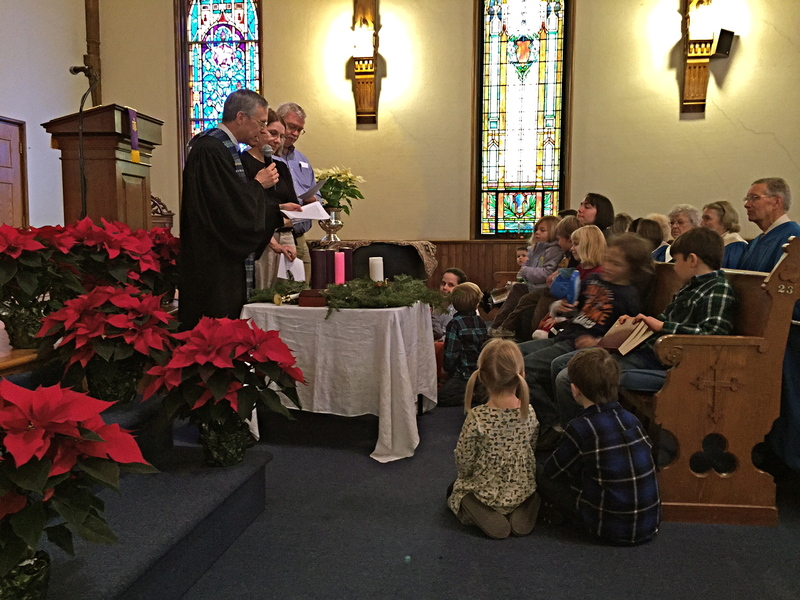 We will light the candle of Joy and read responsively from Psalm 126 and hear Luke 1:39-45 and John 15:9-11. 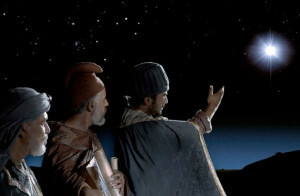 The sermon title will be taken from the John passage, “So That My Joy May Be in You.” We will reflect on what it means to have Christ’s joy in us in very practical terms–it is the peak experience, the highest meaning and pleasure in life, and Christ is very clear that he wants us to experience it to the fullest. Why let anything stand in our way? We light the candle of peace on the Second Sunday of Advent, and we immerse in the vision of Christ as the Prince of Peace coming to earth. Division, conflict, anxiety, terror, violence–all seem to be on the increase in our nation and in the world, so the Sunday of Peace has rarely been so welcome. We will immerse in its hope and joy and love this Sunday. Atul Gawande is a surgeon at Brigham and Women’s Hospital in Boston and the author of the extraordinary book, Being Mortal: Medicine and What Matters in the End. The book shows how there can be a conflict between what modern medicine says to do and what really matters to a person whose life is nearing the end. One of the reasons is that our perspective changes when we sense that our time is short. Modern medicine often asks the dying to endure isolation or debilitation for the sake of safety or prolonging life by weeks or months, whereas an end-of-life perspective tends to value most the continuation of connection, choosing to focus on love and home, family and friends with the precious time it has. Nearing death can open us to the spiritual realm more widely. It can spur us to share our remaining gifts for the good of a world we want to bless before we go. It can change the way we want to live the last stage of our life. Of course, the prospect of death can also paralyze us with fear or negativity, but if we have the courage to open to its truth it can make us wise. It can make us more Christ-like and full of light. The world can look not more terrifying but more beautiful. Paul guides us in that positive direction. He writes, “The night is far gone, the day is near. Let us then lay aside the works of darkness and put on the armor of light.” He urges us to wake up and see that our time is short no matter what age we are, and to make our focus the spiritual life, not the life driven by our selfish desires. God Is in the Manger is a book of readings for Advent and Christmas by the 20th Century pastor and theologian, Dietrich Bonhoeffer. He was a leader of the Christian resistance to the Nazis from the time Hitler gained power until he was executed by them shortly before the end of the war. Click here for more information on God Is in the Manger from a local bookstore. Here are some favorite Advent and Christmas and Hanukkah books for children (but we know some adults who read these every year)! They are all beautiful and deeply moving. We have provided Amazon links because of the information that Amazon provides, but we urge you to support a locally owned bookstore.